Click the button below to add the Glasser Carbon Composite 5-String Acoustic-Electric Violin Outfit to your wish list. Glasser Carbon Composite violins are revolutionary new instruments. Glasser Bows has long been a world leader in developing advanced products with the use of composite materials. Glasser Carbon Composite instruments are the latest development. The Glasser Carbon Composite Acoustic Electric violin combines the advanced technology of the acoustic instrument with state of the art electronics by Bartolini. This allows for the instrument to be played either acoustically or plug in to the Glasser Swordtail active chinrest system. The tailpiece contains a tiny pre-amp, as well as the volume/gain knob. The tone knob is built into the right side of the tailpiece. The instrument is set up with Larsen strings and Planetary Pegs. It also includes a Glasser Braided Carbon Fiber Bow, a Glasser stand, rosin, a polishing cloth, and a 10' right-angle cord, all in a backpack case. Available in 4/4 only. This instrument comes in a variety of transparent colors, at no extra cost. See the image below. In all cases, the colors are tastefully subtle. One can clearly see the carbon fiber fabric through a transparent tint. The black tint is probably better described as blackish, the natural color of carbon fiber fabric. 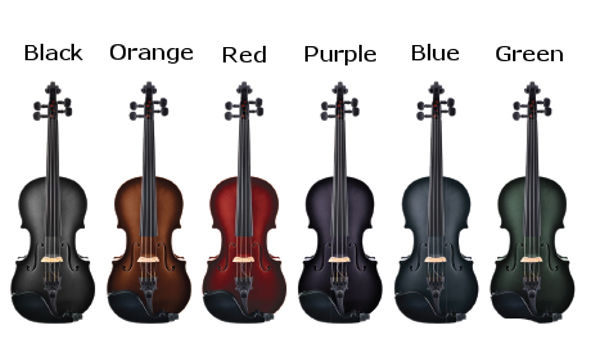 Of all of the colors, we feel that the orange tint has an appearance that is closest to a traditionally varnished violin.